How can you begin to discover a country so vast, so ancient, so diverse? Our China tour with Yangtze River cruise doesn’t waste a moment, ensuring that you’ll experience the most intriguing, renowned sights on what is truly a trip of a lifetime. 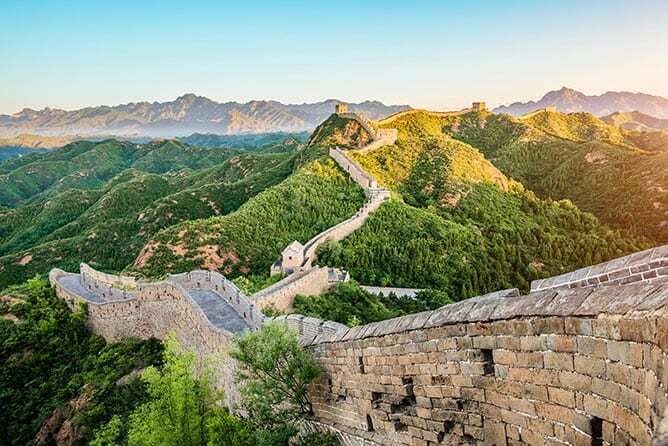 Count on your smarTours® guides to navigate the innumerable details of travel in China and add nuanced narrative to everything you’ll see—from Tiananmen Square to the Terracotta Army, the Great Wall to giant pandas. 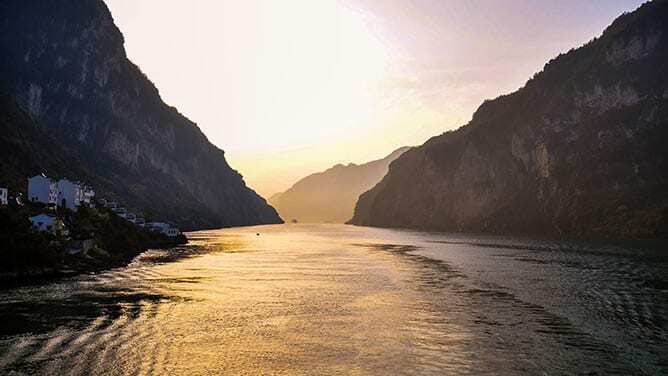 We’ll break the trip to meander along the fabled Yangtze, China’s longest river, on a scenic four-night cruise. And we’re not done yet! We wisely complete this escorted package with a visit to colorful, hectic, exciting Hong Kong. Deluxe Yangtze River cruise aboard Victoria Cruises Premier ship in outside cabin with picture window and private balcony. Victoria Cruises was recently voted as one of USA Today’s 10 Best Readers’ Choice Cruise Lines! 34 meals: 16 full-buffet American breakfasts (B), 10 lunches (L) and 8 dinners (D). Take off in the afternoon on a nonstop flight to Shanghai. Airfare from U.S. is included in your tour package. Ready to see one of the greatest discoveries of the 20th century? You’ll be amazed by the Terracotta Army, an afterlife (and life-sized!) army of warriors, chariots and horses built over 2,200 years ago to guard the tomb of Emperor Qin Shi. This architectural treasure was unearthed in 1974 after being discovered by local farmers. Fun fact: each of the 8,000 soldiers differs in gestures and facial expressions. Our next stop is the Tang Art Museum, where we’ll view intriguing exhibits and demonstrations of Chinese culture, including folk arts, ancient painting works and calligraphy…. 2019 Departures: Single room supplement is $899. Add $100 if departing from New York (JFK). Delight in the amazing skills of this renowned troop during an evening performance. Go behind-the-scenes for an unforgettable tour of Hutong, the old city of Beijing. You’ll ride on a traditional three-wheel cycle (rickshaw) through the labyrinth that comprises this quarter. Walk along ancient back alleys and see where ordinary citizens live side-by-side with gracious old estates once owned by Beijing’s old aristocracy. After an included lunch with a local family, visit the Temple of Heaven, a masterpiece of architectural harmony and precision. Modern conveniences, near the Bund and Yu Yuan Garden and Bazaar. With landscaped gardens and traditional Chinese furnishings, this centrally located yet tranquil hotel is within walking distance of Tiananmen Square. Tea house and Korean spa. Located within walking distance of historic sites, this chic hotel features traditional Chinese décor with modern touches, as well as landscaped gardens. Café on property. Victoria Cruises operates one of the newest fleets of luxury cruisers on the Yangtze River. Your air-conditioned cabin has a picture window and balcony facing the river, two lower beds and a private bath. Superb facilities include a restaurant featuring delicious cuisine, bar, viewing lounge, gift shop and a fitness center. On-board activities include demonstrations, lectures and local entertainment. Victoria Cruises was recently voted as one of USA Today’s 10 Best Readers’ Choice Cruise Lines! Just a 10-minute walk to town center and night market. Outdoor pool, fitness center, well-appointed rooms. A TripAdvisor Award of Excellence recipient, this luxury hotel is set in Tsim Sha Tsui, Hong Kong’s renowned shopping and entertainment district. Views of Victoria Harbour or city. Your departure flights from the U.S. and back are on China Eastern Airlines. You are expected to arrive at your gateway airport no later than 3½ hours before your scheduled departure time. China Eastern Airlines does not assign seats in advance. Seat assignments can only be arranged at the airport upon check-in, and smarTours is not involved with assigning seats. If you have a preferred seating choice, please make sure you check-in for your flight as early as possible. Main Tour: Land-only services start upon independent check-in at Shanghai hotel on Day 2 of the itinerary listed on the tour page. Land-only services end after breakfast at Hong Kong hotel on Day 18 of the itinerary listed on the tour page. Please note that smarTours will provide the invitation letters for the specific dates of our tour. If you plan on arriving earlier or staying in the country after the end of our tour, you will be responsible for securing your own invitation letter for the extra time spent in the country. If you prefer to apply for your visa directly with the Chinese Consulate, you will have to apply in person. Chinese Consulates do not accept mailed-in visa applications. Please contact the Chinese Consulate nearest your area for visa requirements and application forms and fees. If you do not reside close to a consulate, we suggest that you use a visa service to facilitate the processing of the visa. We recommend using CIBT. Please use the following link to download instructions and forms at http://www.cibt.com/home.aspx?Login=50002. If you do not have access to a computer, and you are not able to apply for your visa in person, please contact CIBT to have a form mailed to you. If you plan to use the services of CIBT and have any questions regarding the application, please call them directly at 800-406-1523. We recommend that you apply for the visa in person or through CIBT, at least 45-50 days before your scheduled departure to China. If you apply earlier, your visa may expire by the time you are scheduled to take your trip! PLEASE NOTE: An invitation letter addressed to the Chinese Consulate will be e-mailed to you approximately 50 days prior to your departure date. This invitation letter will include the addresses and telephone numbers of the hotels and land operator in China. You will need to print this invitation and present it with your China visa application. When you send us your final payment, please make sure you provide us with your correct e-mail address on your tour registration form. Also, please note that visa procedures may change at any time. You should check directly with the consulate, or if using CIBT online at www.cibt.com, for the most up-to-date instructions before submitting your paperwork. Please remember that it is your responsibility to obtain the necessary travel documents before the trip. Immunizations are not currently required. However, you may wish to consult your personal physician or local public health authorities about their suggestions. You may expect temperatures averaging in the 50s in March and November; 60s in April; 60s and 70s in May, September and October; and 80s in June through August. Hong Kong temperatures are warmer. The hotels on this tour offer dining choices ranging from cafes/coffee shops to specialty restaurants. Average cost for dinner (excluding drinks) at a coffee shop is about $15–$20 per person. Your hotel will accept credit cards for your non-included meals. This was our first Smartour we took on the recommendation of a friend who has taken several. You did not disappoint. Mark was our tour guide for the group of 13. We were more like a family who he led us through tours, flights, hotels. We never felt cheated with any sightseeing with 4 intro China flights. No time wasted. The hidden gem and highlight for us was Guilin. Beautiful city and extraordinary hotel. The only criticism would be the location of the Shanghai Crowne Plaza. It was 30 mins. Outside of the city. Luckily we did our own air because I knew I needed time to adjust after traveling 20 hours. The daytime tours were excellent but no other guests had the opportunity to see Shanghai at night. Our next stop, Beijing hotel was 2 blocks from Tianemen Square. All 13 of us walked to experience it lite up at night. Thank you for Mark, the itinerary and beautiful hotels. You are on my list of recommended travel tours. The China & Yangtze River Cruise w/ Hong Kong was truly amazing! Smartours had all arrangements down to a science, with all tours and transfers running like clockwork. Our tour director, Jason Hu, was a wonderful, caring young man who went the extra mile to take care of our group of 19....always with a smile. Our tour guides, Jennifer, Tom, Alun, Kenny, Linda and Kelly were very knowledgeable and smoothed the way for some interesting tours, as well as being very attentive. The Yangtze River cruise was wonderful and the scenery magnificent. We could not have asked for better accommodations or meals in China....all places were truly the best, as was the Hong Kong hotel. I would definitely recommend this tour to anyone seeking a top notch tour to see the highlights of China! We just returned from our 4th SmarTour. Our guide Sun Harry made our China trip outstanding. He spoke perfect English, was knowledgeable, kind, friendly,fun and was able to keep our large group of 34 with different needs and wants very happy. He taught us so much about the chinese culture. He always informed us in advance of what we needed for the next adventure. The trip was very active and diversified and we visited cities, villages, and enjoyed lunch in a family home. We interacted and had many opportunities to join local welcoming people in their different recreational activities like exercising in the parks and listening to music. The food was outstanding with many choices. The 4-day Yangtze River was spectacular. The beautiful hotel accommodations were places we would not be able to stay at if not on this tour. We were taken to many cultural performances that we will always remember. Thank you Sun for making our trip so special and teaching us so much. We also enjoyed the other local guides knowledge. From start to finish this trip was packed with amazing historical, cultural, and contemporary China. Our guide Harry, whose pleasure it was to share his passion for his country's history was always helpful and ready to answer our questions. Harry was the best guide ever, and I highly recommend touring with him. The itinerary is not to be believed! The accommodations are deluxe. Pack light, as it is very informal, and wear good shoes. Do not miss this trip. You won't be sorry. I cannot wait to experience another trip with SmarTours! Great trip from the start. China Eastern Airline treats its customers better than a lot of U.S. airlines. Seats had enough room, 3 sufficient meals were served on the 15 hour flight. Our guide, Li Bo, was absolutely exceptional from start to finish of the tour. The hotels were all 5 star. The sites along the trip were all unbelievable, even without the optional tours. We had enough free time to do the little extra things that we wanted to do. The local guide were all very good, friendly and knowledgeable. China surprised us with its absolute beauty, size, opulence of the tourist sites. Even the factories that were visited proved to be eye opening and not just tourist traps. The trip left us extremely happy that we had taken it and was an absolute bargain. On October 13, 2016, we left for our trip to China & the Yangtze River Cruise. 27 people who couldn't wait to meet each other and most of all our tour guide, Mark Ma. To say that he's the best would be an understatement. Our trip was fabulous from the moment we met him til we boarded the plane, homeward bound. His knowledge of China is vast and his English is perfect. This is my 3rd trip with Smart Tours and I love traveling with them. The price is unbeatable for what we always get. From hotels, to transportation, tours and food Smart Tours can't be beat. The trip is physically demanding but the upside is I lost 6 pounds from so much walking. I can't wait for my next trip. Thanks!! My second smarTour trip was simply amazing. The value for money incredible, Harry our tour director just perfect and China mind blowing. I just can't say enough about this amazing experience, except to say "just do it". You won't have any regrets. Overall the tour was great. Harry was quite knowledgeable and a great tour leader who assisted with every needs. He saw that as Vegetarians we were accorded enough choices for our diet. Individual guides in the cities were also quite knowledgeable and provided a wealth of information. This tour with Sun (Harry) was the best tour I have ever taken! He was an excellent tour guide and now friend to all of us that were on the tour together. Not only did we see most of the spectacular sites in China, crisscrossing the country, but Sun provided a lot of information regarding China, was always careful to meet everyone's needs and was a total support throughout the trip. His calm manner of navigating all the details for our group of 23 and for all the airports, buses, cruise boats and trains was amazing. His command of the English language and his sense of humor kept us very engaged! I have great memories of China, learned a lot and made a friend forever with Sun (Harry)! I would like to go on other Smartours and would welcome him as my guide anywhere in the World.